Hayogev is a residential development in the rural area of Jezreel Valley, with 1000 homes, agricultural fields and dairy farms. Located in an open field next to small farms, the local treatment facility handles wastewater from HaYogev and Midrach Oz. The customer was looking for a localized wastewater treatment solution to replace the existing pond system, which faced difficulties in treating the wastewater due to high levels of nutrients. A new state-level regulation concerning reclaimed water required the wastewater treatment plant (WWTP) operator to reduce the nutrients in the effluent stream. The solution had to be odorless and quiet, have low power consumption, and use the existing pond and structure. Santa Margarita Water District (SMWD) is the second largest water district in Orange County, California, providing water and wastewater services to more than 155,000 residents and commercial enterprises. When a new housing development was planned adjacent to SMWD’s 9.0 MGD Chiquita Water Reclamation Plant, the District initiated plans for enhanced odor control solutions. District staff identified the primary process area (grit removal and primary clarifiers) as a significant contributor to odor emissions. After decades in service, the wet well at the Laguna Southwest Orange County Wastewater Authority (SOCWA) lift station became dilapidated. The project included a hybrid manhole/junction structure that would also serve as the bypass wet well during the rehabilitation work. Upon completion of the wet well rehabilitation, the temporary sewage bypass pumping system was removed and normal lift station operation was restored. Serving nearly 16,000 customers, a large-scale wastewater treatment facility in Missouri manages a complex sewer system, and has to contend with regional growth where more residential houses and commercial facilities have been built close to the facility. As a result, foul odor complaints from neighbors continue to increase, and the local town council found itself in need of fully addressing this issue. A constant problem in many wastewater collection systems is the formation of hydrogen sulfide (H2S) in the lift stations as well as from biofilms further downstream in the delivery piping to the wastewater treatment plant. DO2E representatives suggested that the City of Taylorville (IL) use their proprietary digesters equipped with an ozone (O3) capability to remove this problem from our system. A Southern U.S. municipality experiencing taste and odor issues in a certain neighborhood was also having difficulty maintaining chlorine residual levels in the area. 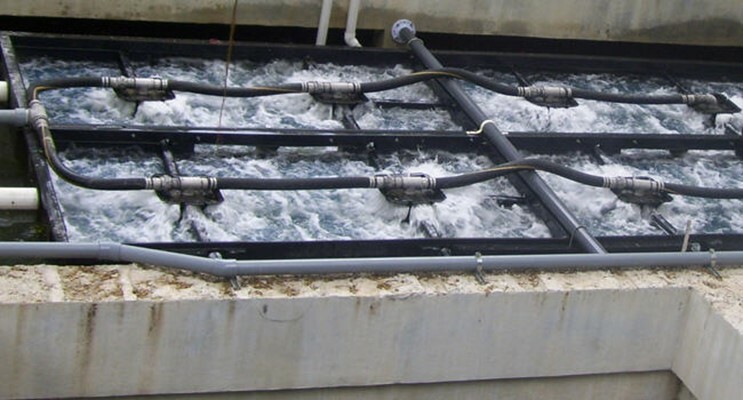 Biological growth was suspected, however, water leaving the treatment plant met and exceeded all water quality requirements. After several investigations, the source of contamination in the distribution system could still not be identified. For years, the wastewater treatment plant in Villa Mercedes, David City, Panama emitted harsh odors and created a rampant mosquito population, a situation the neighboring residents found impossible to deal with. Treatment at the plant needed improvement to successfully treat up to 4.6 million gallons of wastewater per day, eliminate harsh odors and reduce the mosquito population. A WWTP chooses a new screw press that takes up less than half the space that the old belt press had occupied. This was striking for the operations team but not as striking as the fraction of time they needed to spend managing the screw press. Olayan Voltas Contracting Company was awarded the 2013 “Sustainable GCC Project-of-the-Year” by MEP Middle East magazine for the utility complex at Al Bustan Village, a brand new residential community north of Riyadh, Saudi Arabia. I-BOx®6000 Biological Odor Control System Eliminates Severe Odors At California Shopping Center The City of Carlsbad needed a sustainable, environmentally friendly odor control solution with a proven technology offering maximum value measured by performance, reliability, capital, installation, maintenance, and operating costs. Henrico County, Virginia (The County) utilizes multiple chemical technologies in the sewage collection system in order to control hydrogen sulfide concentrations at key points within the system. The county has strict compliance limits for hydrogen sulfide and was facing growing costs, spending in excess of $1.8 million dollars in 2010. Almost all wastewater collection system odor and corrosion problems are a result of the formation of sulfide. Sulfide is formed under the anaerobic conditions that typically exist in wastewater force mains. A special spray gel formulation of Ecosorb® odor eliminator topically encapsulates material, blocking odors from escaping into the atmosphere. Ecosorb® Spray Gel® is an ideal solution for sludge handling and transportation, open-bed waste trucks, working faces of landfills, soil remediation projects, and other solid/semi-solid odorous materials that continuously emit odors. The MCS Odor Control Systems are single stage, skid-mounted, dry media systems, designed for relatively lower odor levels and organic odors. The media may be virgin activated carbon or any of a number of specialty catalytic carbon media. Standard models are available to treat up to 1,400 cfm (2400 m3/h) of odorous air. The I-BOx® Biological Odor Control Systems (patent pending) use a two-stage process with a biological stage to remove 99% of the hydrogen sulfide (H2S), followed by an activated carbon polishing stage to remove residual H2S and organic odors. Standard models are available to treat up to 5,000 cfm (8500 m3/h) of odorous air. The Signet 4632 Chlorine Dioxide Analyzer System is an integrated all-in-one system designed to measure Chlorine dioxide residual up to 2 ppm/mg/l. What’s the best way to fight odors in the wastewater industry? Add a little oxygen. Adding Praxair’s pure oxygen to your existing process can raise the level of dissolved oxygen enough to reduce odors without further action. Even better, the use of a Praxair oxygen acetates treatment system will lower costs and help you meet your environmental goals. Our systems help you manage peak demand and increase capacity while reducing Volatile Organic Compound (VOC) emissions. Alkagen® Solution is a fast-acting pH shift technology that effectively controls odors and corrosion in wastewater systems. This unique, proven product is environmentally safe and uses a combination of alkaline and nitrate technologies to remove and prevent hydrogen sulfide. Alkagen solution also reduces the impact of fats, oils, and grease (FOG) in the system while providing a beneficial alkaline supplement for the treatment plant.